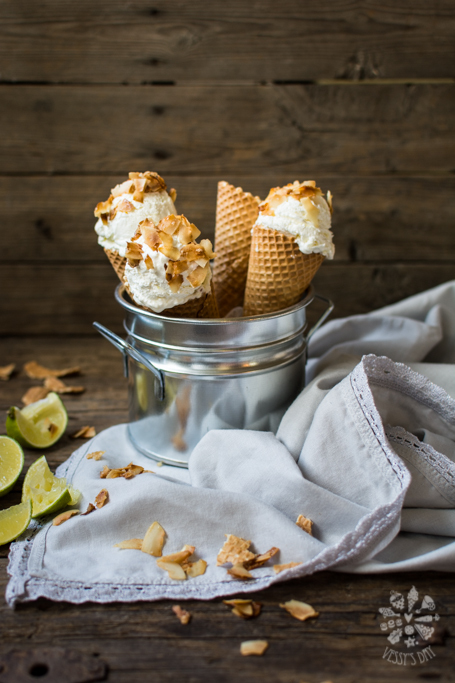 If you a looking for a fresh summer flavor but you don’t feel like baking or cooking at all, then grab this 10 minute recipe and in about 2 hours of freezing you will have this super fresh ice-cream. This recipe doesn’t require the use of ice-cream maker, but if you have one, just add all ingredients to the maker and follow the manufacturer instructions. Whip the coconut cream in a large bowl. Add cream cheese, sour cream, honey, zest and lime juice. Adjust the sweetness by adding more or less honey. Add more or less lime juice to adjust the sourness of the ice-cream. Pour the mixture in a freezer proof container and freeze for a couple of hours. Before serving, remove from freezer for about 30 minutes to soften a bit. 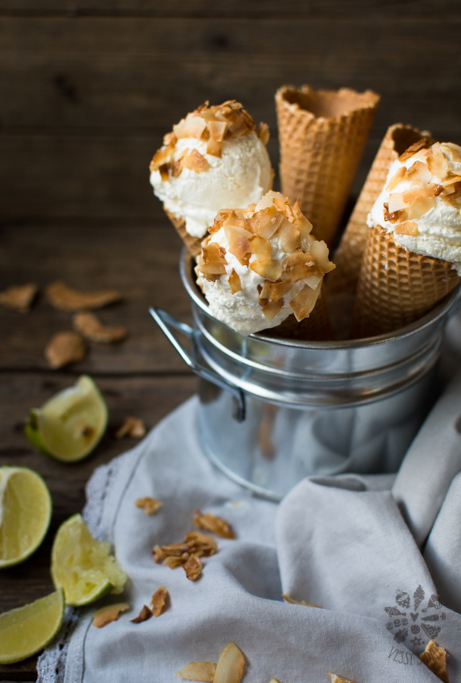 when you say coconut cream, do you mean the thick stuff in the can (minus the coconut water)? thanks! Sophie, that is exactly what I mean! Hope you like it. Yum! I LOVE the combination of coconut and lime! I love this because I posted a recipe for strawberry cheesecake ice cream on my food blog. Haha, well, I guess great minds think similar ice cream flavors, right? Yup! Thanks for checking out my recipe! This looks so good! I love the combination of flavors and how simple it is. I don’t have an ice cream maker so this would be perfect. I’m excited to try this! Thank you Kathleen! Hope you will enjoy this recipe! Let me know what you think!